So, there hasn't been much sewing going on around here lately, but I've got a good reason. I've been waiting for today like a kid longing for Christmas. Today is the last-frost date in my area! I realize how unimpressive this looks, but I've been like a kid in a candy store the last couple of weeks. I just stand outside with a smile on my face staring at my new 4x4' raised beds on the south side of my house. I only have one set-up with grids so far because I want to raise the soil level in the other two before I grid them. I'm using Mel Bartholomew's Square Foot Gardening method in my first ever attempt to grow vegetables. I've been starting vegetable, herb, and flower seeds in my cheap-o patio greenhouse from Harbor Freight. It doesn't maintain the temperature very well at night, but I still think it's worth the 30 bucks I spent on it. In full disclosure, I have NO idea what I'm doing, so I'm open to suggestions if you have any for a first-time urban gardener. Looking at the photo above, I must really like romaine and want to eat a bunch of it all at the same time. In addition to the personal satisfaction I get from digging in the dirt, my daughter is so excited about helping out. We've been sowing seeds together and she's taken on watering and checking on the seedlings. The other day, I even heard the comment, "This is more fun that watching TV!" Hopefully as things really get growing, she'll maintain her enthusiasm and it will continue to be a fun activity we can share together throughout the year. I've been trying to plan my garden (i.e. plant lettuces two every two weeks, beets every three weeks, carrots every three weeks, etc.) but I'm a bit scatter-brained and I just keep planting stuff. Honestly, I'm having so much fun with the process itself, that if I get something to eat in the end, it will just be a bonus. I'm considering an entire 4x4' bed of strawberries, but I'll need to construct a cage/netting to keep the birds out before I transplant strawberries. Shea and I could eat our weight in strawberries. Are you planting a spring garden? I'd love to hear about your garden! Yum stawberries! Best bit is just to enjoy it, I'm a wuss when it comes to gardening I only like it when its warm and sunny lol! And I hate snails but apart from that Like you I enjoy sticking my hands in the mud! I love to garden. Right now I have 78 heirloom tomato plants started from seed in my kitchen window. They're waiting to be transplanted next month. I also plant alot of cucumbers as I can salsa and dill pickles. Advice? 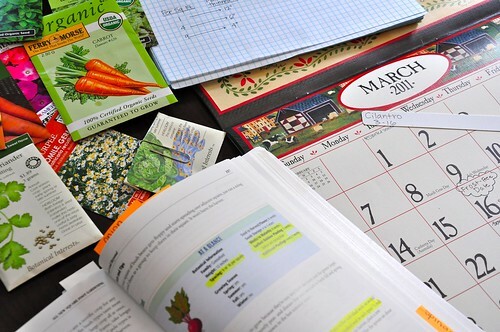 My husband swears by the Almanac and we always plant according to it. You can get one at your local feed/plant store. Exciting! I wish I could grow tomatoes. We don't have any sunshine on our property except around the front of the driveway. I actually put some tomatoes out there one year, because I just can't stand the plastic things at the store that they call tomatoes. Some neighbors thought I was insane, others totally understood. My next-door neighbor accidentally killed them with weed 'n feed just before the first fruits ripened. So sad! Wow! I am impressed. I love the idea that you are introducing gardening to your daughter. I am toying with gardening in straw bales. Washington State University has some info. on research they did for this type of gardening. I have a bad back and this way I wouldn't have so much bending to do. I love my fresh veggies so I think I will go for it! My son gardens and I get some veggies from him but would love to try gardening again. Good luck. You will be suprised how easy gardening really is! I love your raised beds. Really nice. It is so exciting seeing your plants grow and yes, any produce is a welcome bonus! We harvested our first ever zucchini this week, it was wonderful! Looking forward to updates as you go. 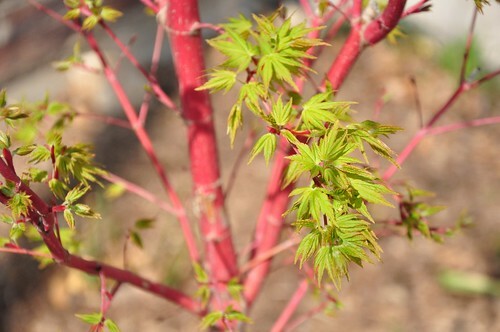 I have that little acer tree in my garden too but mine is behind yours - still bare branches. I'm excited about garden season too! It's such a great project to do with kids outside and an even better way to get them to eat veggies. :) We just put bird netting over our strawberries and it was REALLY easy. Just hammer some re-bar into the dirt at each corner of your bed, then get two long pieces of bendable pvc pipe. Curve a piece into an arc, stick each end onto a piece of rebar, forming one arc at each end. Cover it with your netting, staple it in place, and you're set. Have fun! If you happen to get WAY more than you want they freeze fabulously. How exciting!! I only have a small patio for my apartment, so my gardening options are pretty limited and I've been working mainly with window boxes. Over the summer I put in my first raised bed garden in my father's back yard, but now we have a puppy so I'll need to wait until she's a little older and less rambunctious so she won't destroy the garden. I didn't have really great crops over the summer whenever I tried square food gardening, but my cousin used the same method and got tons of stuff, so I hope you have more of a green thumb than I do. How awesome is that! And that first picture is amazing, btw. 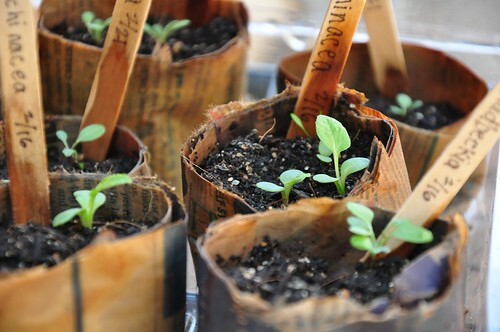 I just ordered my seeds yesterday... we have like the last frost-free date in the country, so it'll be a while... my uncle told me the 1st weekend in April is a good time to start seeds indoors. We'll have a small garden this year, but small is good for me, because otherwise I get overwhelmed and give up! How funny! 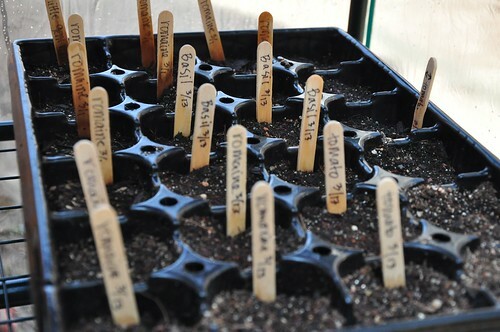 This will be my first year of square-foot gardening as well! Unfortunately, the last frost-free date for Denver is May 24th. Booo. I'm totally jealous that you're planting outside already. I actually have my book sitting next to me because I just finished up my schedule before jumping on the google reader. 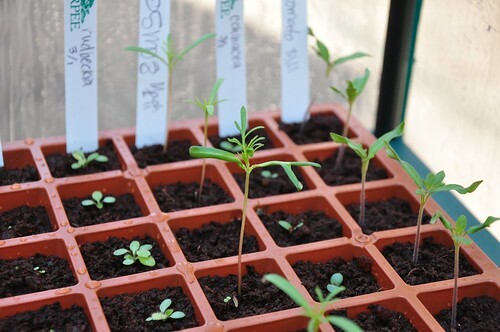 I can't wait to be able to get outside and get some lovely sprouts like you! The seeds sitting on my windowsill haven't sprouted yet. I love to see those first little shoots. I can't wait to plant something, but here we have a long wait still. Your enthusiasm is contagious -- I'm on the edge of going out to buy plants! I wish I had some great advice for you, but, unfortunately, my gardening isn't any better than my cooking! Hope you and your daughter have a bountiful harvest! My brother had his first garden while he was in high school. He followed the square foot gardening methods (from an earlier version). He's always gardened organically and he has since gone on to get his Master Gardener designation. And it all started with just one little box. I can feel your excitement and enthusiasm in your post - it's wonderful! Nice to see spring springing since we are heading into Autumn (fall) days in Australia. Enjoy all that produce you are growing and the flowers that will bloom. I would love it if you kept posting about your garden's progress! Any other books you've found helpful? Isn't Mel's book fabulous?! And you and your daughter will love the square foot gardening. Last year I put one in and it was incredible. No weeds and fabulous fresh produce. I'm doubling mine this year and like you, putting in an entire square on strawberries. Just planted a few plants last year and they were like nothing you have ever tasteed! They never made it to the house because I could not resist the temptation to pop them into my mouth as I basked in the morning sun, watering. Have you started a compost pile? This my first year of trying out my green thumb. I also read Mel's square foot gardening and love a lot of the concepts. Sadly, I have an east-facing balcony, so I'm stuck with containers and not much light. Seeing Jackie's frost date of May 24th made me feel a bit better about DC's date of April 23rd. I can't wait to see how your garden turns out. I think you can't go too wrong what with mother Nature and all! It's a lot of fun! I can't wait to get some yummy veggies! Good luck with your plants and seeds! Since you are in Texas, I believe that raised beds in a south-facing area will pretty much fry your plants once the summer sun really kicks in. Even here in NC, the plants can't take the heat in raised beds, no matter how much you try to keep them watered. I am a fellow Texan and as a kid growing up my mom's parents always planted a big garden to help feed us kids! My favorite part was digging potatoes!! Grandpa would let us crawl down each row and using our hands (and what kid does not like to dig) dig the potatoes! My mom,sisters and I would also help Grandma can fruits and veggies!! Now as an adult my husband and I have a garden each year and I enjoy canning as much as my Grandmother did...such a good feeling to be eating fresh food you nurtered and harvested. Good luck, you are off to a great start!! Several tips on strawberries since I'm just down the road. (I didn't read your other comments so, if I repeat what has already been said forgive me). Birds WILL eat them, but Roly-Poly bugs love them too. Use diatomaceous earth sprinkled around the plants to discourage the rolys. We used hardware cloth covered frames to keep the birds off, but realized that while that worked for the birds it didn't help with the scorching sun. They need bird protection AND shade. There are shade cloths available and while we never got around to that (and have since moved) I can envision a very easy tent-like shade apparatus that will keep out the sun and the birds. 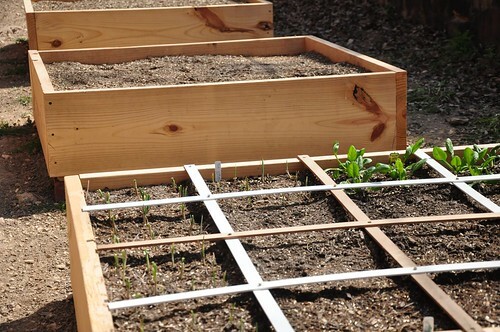 Quite a few years ago I used the square foot gardening method and it worked wonderful!! Enjoy digging in the dirt! We've got some of our seeds started, and DH is getting the garden beds in shape. They havn't been used in the last two years, so they are a bit taken over with weeds, and need a lot of work. With the prices going the way they are, we are not looking forward to paying the prices for vegetables in the stores, and are willing to do the work for nice fresh home grown yummy veggies in abundance.